Cure your sleep apnea the natural way. Click here to get the ebook ;Yoga Breathing for Sleep Apnea’. According to yoga, stress, anxiety, mental pressure and tension all root from an unhealthy and imbalanced body. In short, a person’s mental state directly affects their physical condition. In turn, breathing affects the mind. The first step to treating sleep apnea through yoga is by learning to breathe properly through breathing exercises known as Pranayamas. When practiced, these help to relax and refresh the mind, as well as bring calmness, physical healing and improve concentration. There is a wide range of yoga breathing exercises that can be done. As a matter of fact, there are more than 50 different pranyama forms. The most important for sleep apnea patients are the Kapalbhati, Bhastrika and Nadi Shodhana. Also known as shining skull breathing, it comes from the words kapal meaning skull and bhati meaning shining. The process involves taking in short and forceful inhalation as well as exhalation. This results in cleansing of the cranial sinus which affects breathing, the other organs underneath the skull and many other functions in the system. This pranayama is focused on making the inhalation cycle as long as the exhalation cycle, at the same time making breaths deeper and longer. It is done by through the nose using forcible breathing. A deep breathe taken inwards followed by a long exhalation outwards is done. Equal time intervals are followed in between the two cycles. Known as alternate nostril breathing, Nadi Shodhana literally refers to clearing the channels of breathing in the system. Nadi which literally means river refers to the tubes or pipes of the body. In traditional Indian medicine these are channels that bodily energies flow through. The different nadi’s connect at common points known as chakras. Through alternate nostril breathing, the body and mind becomes relaxed, stress is relieved and the airflow through the nasal passages are regulated. Nadi Shodhana can be done by sitting comfortable with a straight back and relaxed shoulders. The left hand should be laid on the left knee in a relaxed manner, with palms facing upwards. The right hand will be used to regulate alternate nostril breathing. Place the middle and index finger in between the eyebrows and the thumb on top of the right nostril, while the ring finger and little finger stay over the left nostril. Alternately breathe in through one nostril and exhale through the other making sure to press or close the nostril that is not in use and breathe in through the nostril from which air was exhaled. 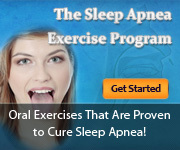 Interested in learning the exact yoga breathing exercises that can cure sleep apnea? Please click here to get your copy of “Yoga Breathing for Sleep Apnea: Your Complete Exercise Guide”.